New Bread SRSLY Kitchen Update #1! As some of you may already know, Bread SRSLY officially has the keys to our new kitchen! Yes, OUR VERY OWN SRSLY AMAZING KITCHEN! We’re so thankful to have found a space that will allow us to keep growing, house our expanding staff (19!! ), and share more bread with all of you. To boot, we will finally be able to bake our bread in a facility free from common allergens! That means no gluten (of course), dairy, egg, soy, tree nut, peanut, fish, shellfish, or sesame. And for those of you with less common allergens, the kitchen will also be free from garbanzo beans, potato, and tapioca. Averse to something that isn’t on this list? Drop us a line! We’re currently in the middle of moving into the new space, and while we make the transition, we will continue baking in the shared gluten-free space we’ve been renting since October of last year. This means that for the time being we’ll continue to bake for just a few days per week, working around the schedules of our kitchenmates. But once we move in and find our “new space” groove, we’ll be able to bake to our heart’s content, all week long! We’ll be able to bake more bread each week and share more of our gluten-free sourdough with gluten-free eaters nationwide. We are planning to greatly increase the amount of bread we ship our through our online store as soon as we hit our stride. Stay tuned for a bigger and better webstore! There is loads of work involved with building out a new kitchen, including permitting, inspections, plumbing, ventilation, electricity, and more. 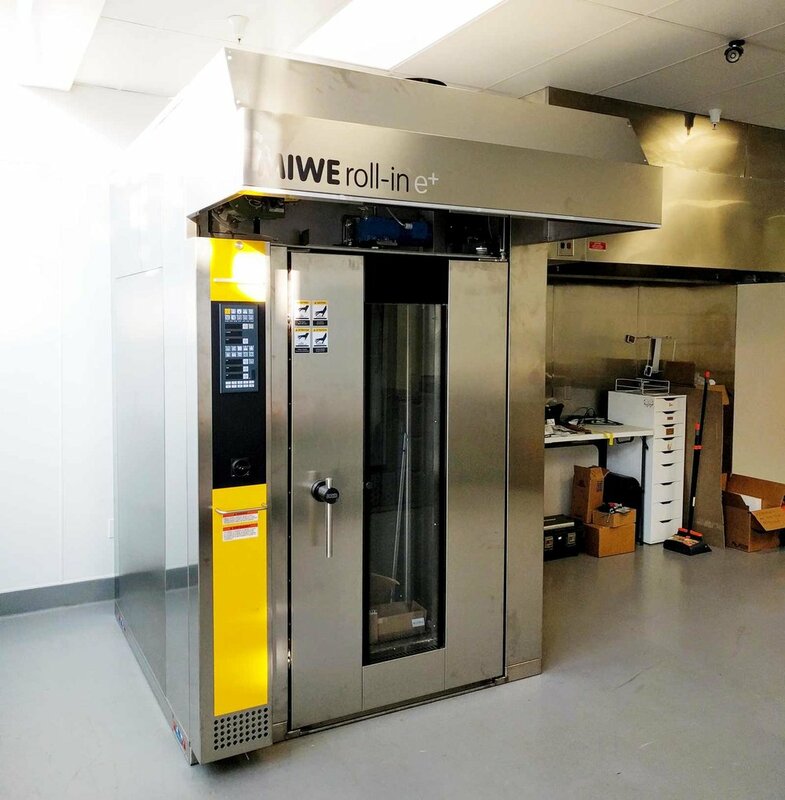 This new kitchen still occupies a compact space, which means we’re also working hard to optimize our workflow to ensure maximum production efficiency. Our Facility Project Manager, Jesse, has been laboring day in and day out to make sure we run as efficiently and safely as possible in the new space. Yay, Jesse! We’re also very excited to say that we started installing our brand new oven this week. It’s a beauty, and we’re jazzed to fire her up and get some baking underway! Our team did a few test bakes before bringing it home to our new space, and it performed wonderfully! Next week we will run gas, plumbing and ventilation (all the fun stuff) to get it up and running. This new oven features lots of functionality that should ensure consistent heating temperatures and bake time, meaning less time tinkering with oven settings, and more time to get more loaves in and out of the oven. This is all so new for us, and we’re learning constantly. It’s a wild, exciting journey, but we’re so happy to embark on it. We promise to keep you updated as we make progress in the new space and actually start baking in our new home sweet home! To all our wonderful customers, your support means the world to us. Thank you for your incredible patience as we learn more than we ever thought we’d know about running a bread company. The ups and downs and ins and outs make our heads spin, but I think we’re nearing the finish line. We truly cannot wait to get bread to you all once more, and we’re so excited to have had this time to improve Bread SRSLY’s operations, staffing, safety, and deliciousness. Our brand new oven in our very own kitchen! 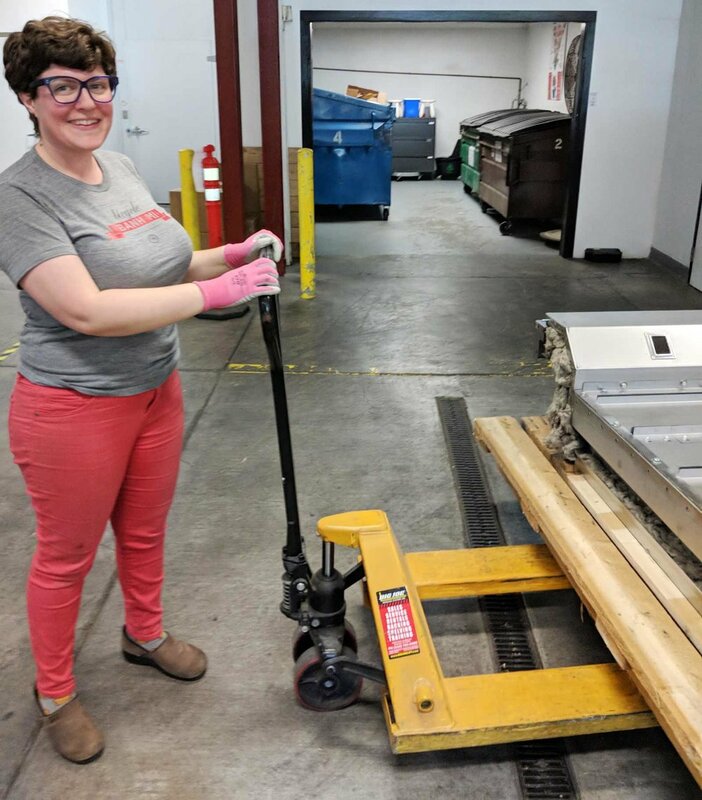 Sadie workin' the pallet jack!